Don’t get me wrong, it’s a great tool; how many gadgets would get you out of bed 10 minutes before midnight to do some jumping jacks to get you to your goal before midnight strikes?! But this is where I see a flaw…I set my own goal. I see everyone interacting with Nike via Facebook and twitter sharing their success stories of stupidly long streaks (the amount of days in a row you hit your goal). 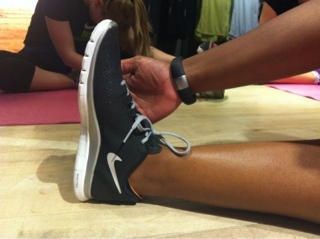 Nike claim that an active day is 3000 NikeFuel. I can hit this with a short run, an afternoon on the sofa and a little bit of housework so if I set my goal to 3000, am I really challenging myself?! Initially when I got my fuelband I spent a few days getting some base data about my activity levels. It seemed that I always came in just below 3600 so I set my goal for 3800. This was a challenge, meaning I have never had a streak longer than around 20 days whereas some people are into streaks of 200 days or more! So I think it’s time for Nike to up the game and add fuel to our fire! I think there should be a setting where the device randomly chooses your goal for the next day. Planned a lazy Sunday, but then Saturday night you get set a goal of 6k NikeFuel?! …you’re gonna have to work to hit that goal! Now THAT my dear friends is a challenge! What do you think?! How do you set your goal?! If you were offered the choice would you take up the challenge? The shoes you wear affect the fuel you earn! Wear shoes that cushion your steps and absorb the forces…get less fuel! The day I ran a half marathon (21k) I got about 6k NikeFuel due to running with light and small steps. My best day has been just over 10k…made up of running (8k) and Zumba! But then again it’s all about intensity too…if two people travel 100m, one sprints and one walks, the sprinter should get more fuel! 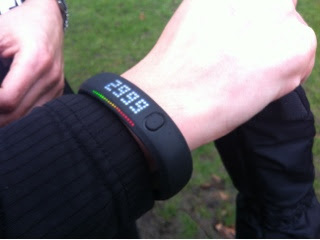 So in 2013 I’m aiming for a 15k NikeFuel day! …I’ve seen it done, but this is about challenging myself! Have you got a fuelband?! Or maybe thinking of buying one?! …what’s your best day been so far?! You are most welcome! …and good work on prioritising your health and fitness 🙂 It's hard sometimes but it sounds like you have friends who understand and support you!! Keep at it!